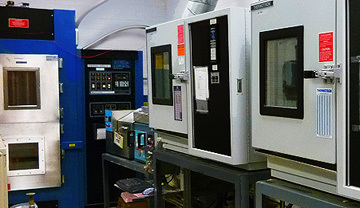 Coilcraft CPS testing facilities in North America and Asia perform comprehensive laboratory testing of electronic components. In addition to testing the components we manufacture, Coilcraft CPS provides a wide range of services to help you determine the reliability of assemblies you manufacture. Coilcraft routinely performs complete sets of tests in accordance with established industry standards and specifications or specific tests designed to validate product reliability, repeatability and/or compliance to published electrical and physical specifications. We can perform custom screening and qualification that may be a modification of an existing Coilcraft document or implement custom screening or qualification from the ground up. Whatever the requirements, Coilcraft can adapt to your needs...not the other way around. Coilcraft designs and manufactures fixtures that interface with the most commonly used test equipment in order to test many surface mount and leaded components. These fixtures are invaluable tools for companies that perform their own first article inspections.